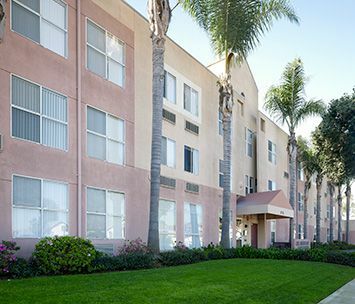 South Bay Co-op is a gated affordable senior housing community located in the beautiful city of Lawndale, California. South Bay Co-op, built in 1990, has 43 one-bedroom apartments and 13 efficiency (studio) units. South Bay Co-op is located next to one of the busiest freeways in California, the 405. South Bay Co-op Apartments does not allow smoking in any common areas, and within 25 feet of the building. We have free bus service and a supermarket within walking distance. Many other services are available within the community of Lawndale. The city of Lawndale provides its senior community with additional services such as: senior fitness classes, small bus excursions, art classes, etc. We are an active, diverse community that communicates well with one another. South Bay Co-op was also nationally recognized as “A Community of Quality” by the National Affordable Housing Management Association in 2011. South Bay Co-op is proud to be recognized as a NAHMA Communities of Quality Corporate Partner. This designation is for multifamily properties that have achieved a high standard of excellence in the way they are managed, the services they provide residents, the experience and training of personnel, and other criteria.